Judging by the first two weeks I’ve spent in Spain, I will feel like I have packed in a whole lifetime’s worth of experiences by the time my three and a half months here are up. Time here feels contradictorily fast and slow – while two weeks has felt more like a month, I’m already lamenting the fact that I didn’t decide to study abroad for a whole year. The feeling that time has been warped is due in part to how busy I have been. While at home I’m more apt to pass up activities in favor of relaxation, here I have been embracing the “you’re only here once” mentality and have therefore had days that never seem to end (but have taught me that I hit my limit somewhere around 4:00am). When days last that long and almost every moment is full, some experiences are bound to be less enjoyable than others. Sometimes I feel excited by new things. Other times, I just feel alienated. Whenever I start to feel overwhelmed, I try to keep in mind something one of our program directors told us on our first day here: “No one’s culture is good or bad, or better or worse than another – they’re just different.” Reminding myself of this from time to time helps alleviate the unavoidable awkwardness that comes with learning different customs and a different language. Bearing this in mind, I have tried to categorize some of my experiences thus far into three categories. First, I’ll list ones that have been truly good. Second, the truly bad. And third, the “different” – experiences which are both good and bad in turns and which I will eventually come to embrace as simply new realities that shape my life here. Okay, so maybe I’m still bitter that they cruelly took away naptime from us post-Kindergarten, but I’m strongly in favor of the semi-official 2-5pm naptime that Spaniards have built into their schedule. In the first week, whenever I started feeling homesick and I went on a tour with my program, I instantly felt better. The historical sights are so beautiful and interesting that you can’t help getting caught up in the moment. As a plus, these excursions allow you to meet all the great people you’re studying abroad with! Bond while exploring a new city and taking all the same tourist-y selfies. 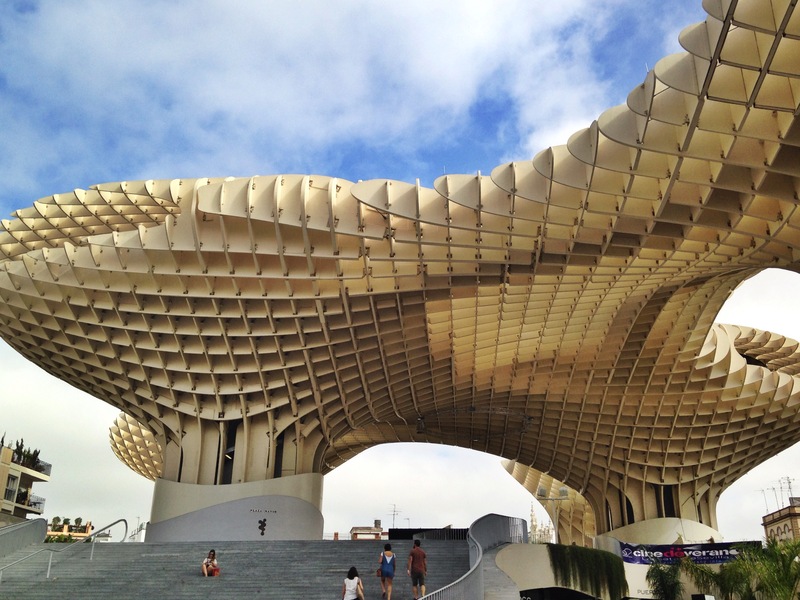 Beneath “Las Setas,” the largest wooden structure in the world built in one of Sevilla’s plazas. Under it there is a fresh market and a museum that has preserved the ancient ruins (dating back to the Roman empire) Las Setas were built upon. 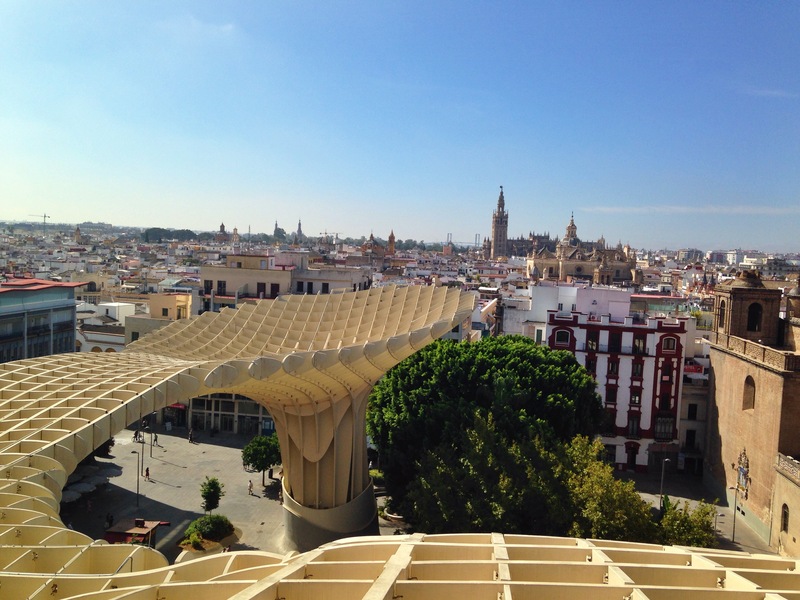 On top of “Las Setas” – a beautiful view of Sevilla. One of my favorite excursions I’ve gone on yet! The first day we arrived in Seville, one of the host families mistakenly loaded a piece of my luggage in their car. I realized how dependent I am on my laptop after three days without it. This is only a brief look at what my life in Spain has been like, and so far I can say that the good points definitely outweigh the bad. The cultural differences are starting to feel like they are just that – different, new, exciting, though at times overwhelming. Every day I am so glad to be here, to be absorbing a new culture, and to be learning how to adjust to the many nuances it holds. Previous Where. Are. The Kleenexes?! Next I just want to know where the trash bags are. I promise.